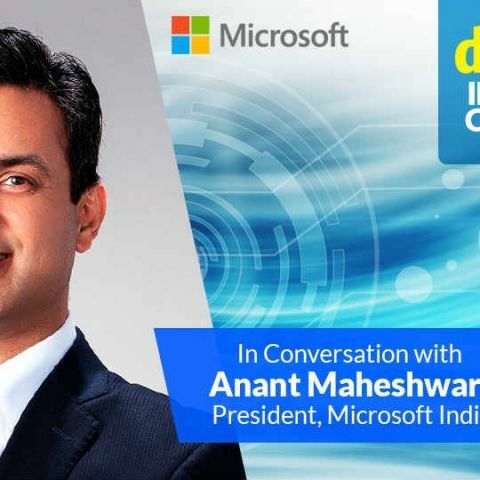 On the sidelines of a visit to Microsoft’s Hyderabad campus, India President Anant Maheshwari had a tight-lipped conversation with Digit about the company’s mobile strategy as well as its plans for the Xbox One X, Windows 10S and the Surface-line-up in India. At a Media and Analyst event organised within the Microsoft Hyderabad Campus, Anant Maheshwari, President for Microsoft India laid out the company’s enterprise and partner-led growth strategy for the country, but there was little said about Microsoft’s latest consumer offerings. While Microsoft has opened up a lot about its various Azure-based enterprise solutions, its government tie-ups, its startup connect and its apps footprint in India, we have not heard much from the company about its plans to drive new hardware and software (Surface Book, Surface Studio, Xbox One X, Windows 10S) in the country. There’s also the existing ambiguity around Microsoft’s global smartphone strategy, if they still have one that is. Is there a Surface Phone in the works, especially after Microsoft officially killed the Windows Phone this year? We touched upon some of these questions and more in a quick conversation with Maheshwari. Here’s what he had to say. Digit: You Spoke about a time when the PC was a key driver of Digital Transformation, and from there on, it evolved to the server, the cloud and now, the Intelligent Edge. Don’t you think the smartphone is still a key driver of Digital Transformation in India? If so, how is Microsoft a part of the Indian mobile user’s experience, compared to the way Google has become a daily driver of most smartphone users? Anant: I would agree with you that the mobile phone revolution has been a critical driver of digital transformation. Three years back, Microsoft was amongst the first companies to say that we are living in a mobile first, cloud first world. What has happened over the last three years is that I think we moved on from the mobile being the primary intelligent edge to many other capabilities of many other edge devices coming into play. So, mobile continues to play an important role in edge devices, but there are many many more and that’s why I think the narrative is about the intelligent edge and the intelligent cloud. But, the word ‘intelligent’ is also very critical over there because artificial intelligence is playing a critical part both in the cloud and on the edge devices. Secondly, how is Microsoft a critical partner or player in the mobile revolution...I’ll just take my iPhone out and I would say - Listen, when I work on a daily basis on Office 365, I seamlessly work between my Surface, which is a Microsoft device and an iOS device, and similarly for all Android phones. So, I think the world is very different today where the OS may not necessarily be the driver. Digit: So, Microsoft is focussing more on productivity applications when it comes to the mobile experience, instead of making products like Cortana available more widely? Anant: I would say it’s multi device-multi sense, wherein it doesn’t matter what device or what screen size or form factor you are accessing. The experience that you as a customer should have should be seamless. I’ll give you this example that I had very recently. I was sitting for dinner with 20 people, where I was trying to balance my surface on my knees and trying to type. I thought, you can’t really use a large form-factor device at that point, and I was typing some notes on my OneNote app, in my Surface. I had already written Eight points there, that’s why I didn’t want to start fresh in a new page on my phone. I just moved to my iPhone OneNote app and the eight points had already synced over the cloud. To me, that is the real modern workplace that we work in and that's the experience of mobility that Microsoft brings. Digit: What is the last word from Microsoft on making smartphones? We keep hearing rumours of a Surface Phone. Is there one in the works? Anant: I think given the world that we live in, we should never be talking about last words. Digit: So are there any new words you would like to share with us? Anant: I would say in the form-factors we are currently really focussed on, clearly the Surface line of products which has Surface Hub, the Surface Studio, the Surface Book and the Surface Pros, we have a lot of capabilities across those devices, and we are continuing the focus on those form-factors. As far as mobiles are concerned, we are working with all the major OEMs and OS players to create new applications and experiences. We want people to be able to access all Microsoft apps and services on the mobile form factor also. Digit: You mentioned the Surface line-up, but we barely see any products from that in India. When can we expect Microsoft to start bringing these to the Indian market? Anant: It clearly depends on what’s the need in the market and what are people asking. As we see any such demand spikes coming through, we will be working early on the curve to bring a lot of these products in. Digit: Aren’t you currently seeing a demand for products like the Surface Book in India? Anant: There’s of course a demand. But, Microsoft is not just about our first party products. Microsoft is also, a large part on the partnerships that we have through our OEM partners like HP and Dell and many others. A lot of these players are bringing some cutting edge products into the market already. We are satisfying that demand through one channel or the other for now. Digit: Something you touched upon in your keynote at the Microsoft conference in Hyderabad was gaming. It seems like Microsoft has lost interest in bringing its gaming portfolio of products to India. The Xbox used to be a well marketed console in India at one point of time, with Akshay Kumar as the brand ambassador. The company’s approach to gaming in India seems to have taken a back seat. Why is that so? Anant: It (Gaming) remains one of the key focus areas. It’s one of the five core solution areas that we drive globally and in India also. The big shift in the gaming industry globally has been towards online gaming capabilities, rather than pure play hardware. Therefore, I think that’s the big shift that’s happening across the world and Microsoft continues to play a significant role here. Digit: But, the Microsoft Xbox One S was launched in India almost a year after its international launch. That says something. Is this how Microsoft plans to introduce the Xbox One X in India as well, a year later? Anant: I would not take any continuation of trend lines from what has happened in the past to the future. It highly depends on what the offering is and what the opportunity for that offering is in the market, and if it makes sense for it to economically to have it available and at what point. As soon as we have very clear messaging to share on that one (the launch of the Xbox One X) we will. Digit: Shifting gears to the Microsoft Connected Car platform, during the Media conference, Ola announced that Microsoft’s range of productivity tools will be made available to riders soon. Can you tell us how that partnership will work? Anant: This is something we are very excited about. Ola is driving innovation across the country, not just in the ride sharing market, but in the broader experience market. I would say that there’s lots more coming in that partnership. On Ola Play, we want to bring the full capability on entertainment, technologies around Search, around the modern workplace, all of that is what we are focussing on. It also depends on the modern workplace that the rider will be using, it may not necessarily be Office 365, but products like Skype could be a big partner. Digit: Quick last question. Could you tell us when to expect Windows 10S powered laptops in India? Since the OS is optimised for lower-end devices, India is a natural market for it. Can you tell us what’s in the pipeline for Windows 10S devices in India? Anant: I would say, rather than think of just Windows 10S, you should think about Microsoft 365 which combines Windows plus Office 365 plus enterprise plus mobility and security. That’s really the focus for India. And W9 will launched in 2015. But are you sure... is it wind 9 or win 8.2 ? Anybody know more about Android L . And when it will be coming ?